Where is the Historical Proof? One of the most common questions people ask is “Where is the archaeological and historical evidence to support the events described in the Torah?” Thankfully, in recent decades scholars and archaeologists have uncovered a tremendous amount of historical evidence to support the people, places, and events of Scripture. Below is a collection sampling some of this evidence. 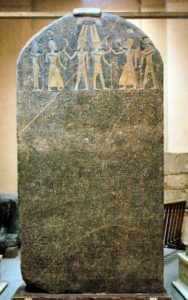 The Merneptah Stele is an ancient Egyptian inscription dating back to the time of Pharaoh Merneptah (r. 1213-1203 BCE), describing his military conquests. Towards the end, there is a clear reference to the nation of “Israel” in the land of Canaan. This is perhaps the earliest known reference to Israel, and the time frame is perfect. According to the traditional Jewish chronology, the Israelites left Egypt in the Hebrew calendar year of 2448 AM. This corresponds to 1312 BCE. The Israelites would have then entered the land of Canaan in the year 1272 BCE, after a forty year sojourn in the Wilderness. As the Tanakh states, it was Joshua that lead the conquest, and he actually did not complete the take-over of the Holy Land. According to Jewish tradition, he died in the year 2516 AM, or 1244 BCE. Historians date Merneptah’s campaign into Canaan around 1210 BCE. This is just three decades following the death of Joshua, when Israel was mired in the difficult and generally lawless period of “Judges”, when they were constantly oppressed by various foreign powers (like Merneptah), only to be saved from time to time by various brave warriors. Interestingly, Merneptah was a son of the Pharaoh Ramses II (c. 1303-1213) BCE, typically identified with the pharaoh of the Exodus. Indeed, the Torah explicitly mentions (Exodus 1:11) that the Israelites built the city of Ramses. The Merneptah Stele mentions a number of Biblical cities, including Ashkelon and Gezer. Most significantly, it confirms the existence of a national called Israel over three thousand years ago. The stele is currently housed in Cairo’s Egyptian Museum. 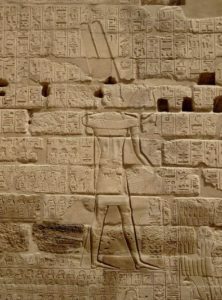 The Bubasite Portal in the ancient Egyptian city of Karnak describes the campaigns of the pharaoh Shoshenq I (r. 943-922 BCE), including his foray into Israel and sacking of various cities in the “Kingdom of Judah”. This may be the earliest reference to the Jewish kingdom. Again, the time frame is perfect, as Shoshenq I reigned approximately four centuries after Ramses II and Merneptah, just as Jewish chronological dating puts the start of Israel’s kingdom period around four hundred years after the Exodus. More specifically, the first king, Saul (or Shaul) began his reign in 2881 AM, some 393 years after Israel entered the Holy Land. Archaeologists have uncovered at least 27 scarab seals bearing the name “Yaqub” or “Yaqub-Har”. It is thought that these belong to an Egyptian king who was a foreign ruler hailing from Canaan, and not a proper Egyptian pharaoh. He would have reigned in the 14th Dynasty, estimated to be around 1725-1650 BCE. Three of these seals have been found in Israel, and four more in Egypt, with the rest distributed in various other locations. 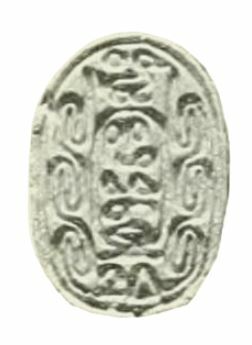 One of the Yaqub-Har scarabs from the Middle Bronze Age, currently in the British Museum. Of course, “Yaqub” is the same name as Yakov or the Biblical Jacob, the third Patriarch of Judaism. The Torah tells us that Yakov spent most of his life in the Holy Land, and the last seventeen years of his life living in Egypt. This may explain the presence of seals bearing the name Yaqub in both Canaan and Egypt. Aside from these areas, Jacob spent twenty years living in Charan, and much of his life journeying in other places, too, as we read in the Torah. The presence of so many seals scattered between and around Egypt and Israel is fitting. The timing is right, too. 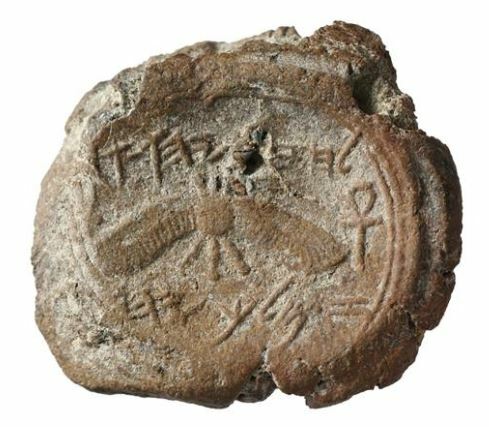 The Yaqub seal discovered in Tel Shikmona, Israel (near Haifa) has been dated to 1750-1650 BCE, which also fits with the 14th Dynasty estimate above. In traditional Jewish dating, Jacob was born in the year 2108 AM, or 1652 BCE. Although Egyptologists generally maintain that the Yaqub-Har seals do not have any relationship to the Biblical Jacob, they may have to think again. Recall that Jacob’s son Joseph was the powerful viceroy of Egypt, and we read in the Torah how well-received Jacob was in Egypt, and even how the Egyptians had Jacob mummified and entombed like one of their own royals! (Genesis 50:2-3) We read how all of Egypt mourned Jacob’s death many days. They would have certainly had seals bearing his name, written in their own Egyptian hieroglyphics. These seals may attest to that. At the very least, they confirm the existence of a powerful man named Yakov who came from the land of Israel to Egypt in the very time period that the Torah speaks of. Discovered in 1861, these two Assyrian tablets describe a war between the Assyrian king Shalmaneser and one “Ahabu Sirila”, ie. Ahab of Israel. Of course, Ahab is a key figure in the Biblical Book of Kings, where a Shalmaneser is mentioned by name as well (II Kings 17 & 18). 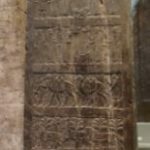 The monoliths also mentioned “Ben Hadad of Damascus”, another Biblical figure from the same time period mentioned many times in the Books of Kings and Chronicles, as well as Jeremiah and Amos. 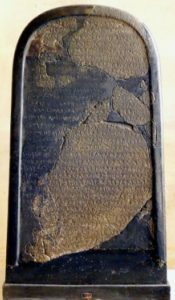 Also known as the Mesha Stele, as it was commission by King Mesha of Moab, the Moabite Stone is of tremendous importance. While it focuses on praising the Moabite god Chemosh (mentioned in Scripture), it also happens to explicitly mention the God of Israel (YHWH). Dating back to 840 BCE, it may very well be the oldest extra-Biblical source to speak directly of Hashem. The Stone also mentions both the “House of Omri”, ie. the Northern Kingdom of Israel, as well as the “House of David” [line 31 has the letters BT DWD], ie. the Southern Kingdom of Judah. While some disputed the translation of BT DWD to “House of David”, another fragment discovered since (at Tel Dan in Israel) clearly references BYT DWD, confirming the House of David as a legitimate, historical dynasty. 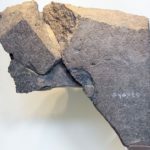 The Moabite Stone describes how Omri of Israel oppressed Moab for many decades before King Mesha successfully fought back. It describes how he attacked a city inhabited by the tribe of Gad (one of the Twelve Tribes of Israel), killing all 7000 of its men and enslaving the women and children, as well as taking its holy “vessels of YHWH”. The Moabite Stone thus serves to confirm the existence of the two Biblical Jewish kingdoms nearly three millennia ago, their royal dynasties, and the fact that they worshiped Hashem. Further proof is brought from the Black Obelisk. This large, well-preserved stele depicts five scenes, each a submission of a different kingdom to Shalmaneser III of Assyria. Israel is the second of those five. Here, we see mention of “Yehu of the House of Omri”, an obvious reference to King Yehu (or possible King Yehuram) of Israel. 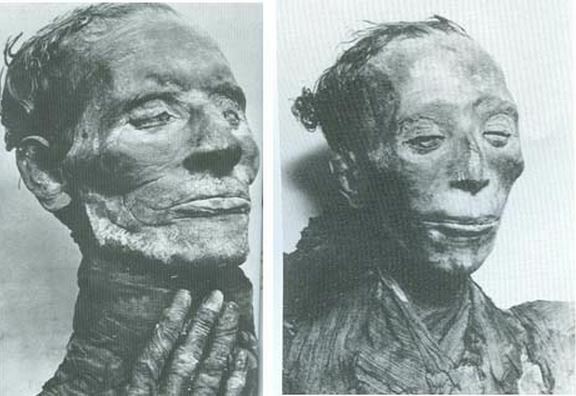 In 1905, archaeologists discovered the mummies of a husband and wife in Egypt’s famous Valley of the Kings. The male, Yuya, has Semitic features uncharacteristic of ancient Egypt. He is described as a superintendent of food, a viceroy to the king, and even a father to the king. These are essentially the very same titles that were held by Joseph according to the Torah. Just as Joseph was famous for being a dream interpreter for the pharaoh, archaeologists discovered a stele describing the ominous dreams of the pharaoh Thutmose IV, whom Yuya would have served. In fact, the name “Yuya” has the same root (in Egyptian) as “Joseph” in Hebrew. The time periods match up perfectly, too. Click here to read more about the fascinating parallels between Yuya and Joseph. The Taylor Prism is a detailed account of the conquests of the Assyrian king Sennacherib. Archaeologists have actually discovered three identical copies of this prism (the others are the Jerusalem Prism and the Oriental Institute Prism), calling the three “Sennacherib’s Annals”. Of course, Sennacherib features prominently in the Tanakh. He was the one that destroyed the Northern Kingdom of Israel, and nearly succeeded taking the Southern Kingdom of Judah, too, were it not for a divine miracle, as described in II Kings 18-19. The Prism explicitly mentions Jerusalem and its king, “Hezekiah of Judah”. It closely parallels the account in the Book of Kings, including Hezekiah’s strong resistance to Sennacherib’s rule, and that Hezekiah did have to capitulate somewhat, though he did not surrender. The Tanakh tells us how God sent an angel to strike the Assyrian camp in the night (II Kings 19:35). Many thousands of soldiers did not wake up in the morning, and Sennacherib fearfully fled. Of course, Sennacherib would not record this in his own “victorious” records. Thus, unlike his other glorious conquests, with regards to Jerusalem and Hezekiah the Prism simply concludes: “As for Hezekiah, I shut him up like a caged bird in his royal city of Jerusalem.” That’s the best Sennacherib could do! The Taylor Prism is of monumental importance because it clearly and explicitly (with no need for any interpretation) discusses the Biblical king Hezekiah, of David’s royal lineage, as well as the Kingdom of Judah and its capital Jerusalem. It confirms in perfect detail a lengthy Biblical passage. It confirms the destruction of the Northern Kingdom of Israel and the exile of its tribes (henceforth popularly known as the “Lost Tribes of Israel”). And by glaring omission, it confirms a great Biblical miracle wrought by God. Cuneiform inscriptions on the Taylor Prism that speak of Jerusalem and King Hezekiah. 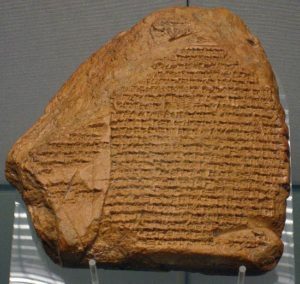 The Nabonidus Chronicle describes the reign of the last Babylonian king, Nabonidus. It mentions how Nabonidus left his son Bel-shar-usur in charge of Babylon for the last ten years of his reign, as Nabonidus was busy conquering in distant lands. At the end of this period, the Persians conquered the kingdom, putting an end to an independent Babylon for good. Of course, this is attested to in Scripture, where we read of Belshazzar’s last days as the de-facto ruler of Babylon before the Persian invasion. The Persians were led by Cyrus the Great. So great was he that in one place Scripture (Isaiah 45:1) actually calls him the anointed messiah! This isn’t surprising, considering it was Cyrus who freed the Jews from the Babylonian Captivity, allowing them to return to their Promised Land and start rebuilding Jerusalem’s Holy Temple (Ezra 1:2-4). By defeating Israel’s oppressors and restoring the Jews to their land, Cyrus accomplished two major requirements for being Mashiach. Indeed, the Talmud (Megillah 12a, Rosh Hashanah 3b) says that Cyrus was a potential messiah, but unfortunately didn’t live up to that potential at the end. The Torah specifically mentions the names of two of the Israelite slaves in Egypt: Shiphrah and Puah (Exodus 1:15-20). They were the midwives that were tasked with slaughtering the newborn Israelite babies. They protected the babies instead, and for this God blessed them greatly. Amazingly, archaeologists discovered a papyrus dated back to the pharaoh Sobekhotep III which provides a list of slave names. One of these is shpra. The papyrus (35.1446) is currently at the Brooklyn Museum. More recently, archaeologists in Jerusalem uncovered a large number of bullae, or clay seals, dating back to the First Temple period. The most notable of these is a clay seal that says Yeshayahu Navi, “Isaiah the Prophet”. Many have since described it as the “signature of the Biblical prophet”. Some disputed the claim based on the tiny detail that the seal is fractured and the letter aleph (א) at the end of navi (נביא) is not clear. 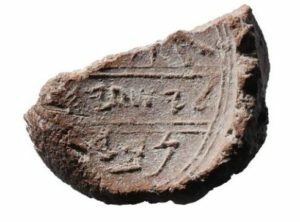 However, this seal of Isaiah was found just metres away from another seal, unarguably belonging to King Hezekiah. As we read in the Tanakh, Isaiah was the prophet in the court of Hezekiah, and in Jewish tradition the king later married Isaiah’s daughter (Berakhot 10a).